Businesses or residences that are not connected to the municipal water system generally rely on a septic system for their wastewater treatment needs. However, not every property is a good candidate for a septic system. In cases like these, at Southern Water and Soil, we may recommend a package treatment plant to treat wastewater on your property. Our team has over three decades of experience performing package plant installations in Tampa, Florida and is committed to your complete satisfaction. Before we perform package plant installations, we make sure that our client is fully aware of how their new system will function. To give you a better feel for how these systems work, package treatment plants come with a multi-chamber tank. This is different than traditional septic systems because package treatment plants use an aerobic digestive process to treat the raw sewage. 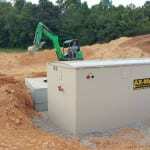 Package wastewater treatment systems also treat wastewater in three different stages. During the first stage, the sewage enters a pre-treatment chamber where heavy solids sink to the bottom, and lighter waste, like oils and grease, remain at the top. Second, the liquid mixture and the scum are mixed with oxygen, and aerobic bacteria reduce the sewage into simple compounds. Finally, the heavier solids and the effluent are separated in the clarification chamber and are returned to the aeration chamber for additional processing. The leftover clarified liquid is then transported to the environment for disposal. When our team performs package plant installations, we use Orenco and Norweco products. One of the main reasons why we have formed a partnership with this leading manufacturers of wastewater treatment products is because they offer top of the line systems for municipal areas to the single family home. If you would like to find out more about package plant systems, how they work, and why they are a beneficial wastewater treatment option, contact us at Southern Water and Soil. We look forward to hearing from you! At Southern Water and Soil, we offer package plant installations in Tampa, Odessa, Lutz, Cornelius, Land O’ Lakes, Brandon, Mooresville Orlando, Plant City, Davidson, Dade City, Bartow, Lake Wales, and Lakeland, Florida.